Many women planning to expand their family worry that their overactive thyroid might negatively affect their fertility and lower their odds of getting pregnant. 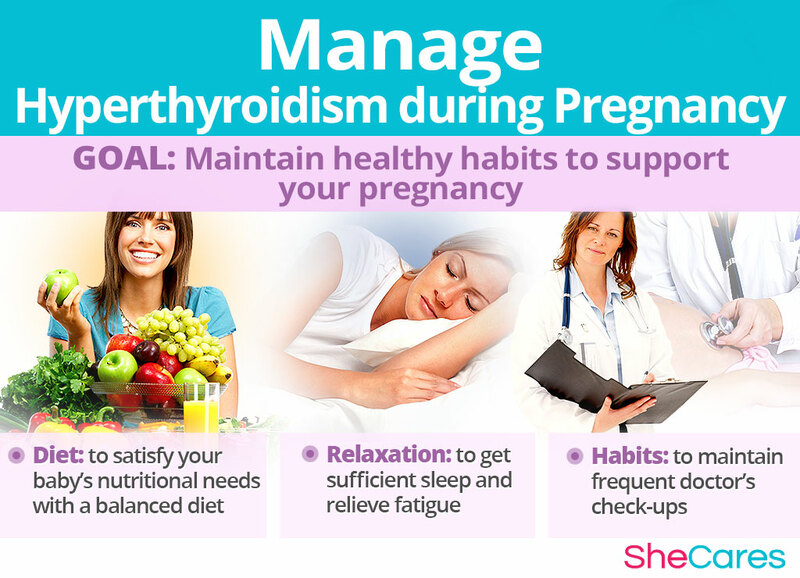 Although hyperthyroidism in pregnancy requires thorough treatment and close monitoring to prevent serious complications, the good news is that most women with thyroid disease go on to have safe pregnancies. Keep on reading to find out what to include in your pre-pregnancy action plan that can help you get pregnant and bring your baby to term without difficulties. The most common cause of hyperthyroidism is an autoimmune condition, called Graves' disease. It triggers the body to produce an antibody, called thyroid-stimulating immunoglobulin (TSI), which leads to an overproduction of thyroid hormone. So, women with hyperthyroidism have high levels of thyroid hormones and low TSH (thyroid stimulating hormones). The symptoms of an overactive thyroid might include chest palpitations, heat intolerance, unintentional weight loss, and mood swings. Menstrual cycle abnormalities, such as infrequent, long, or heavy periods, might make it more difficult to get pregnant. Ovulation disturbance might occur even if a woman has regular periods and might lead to infertility. 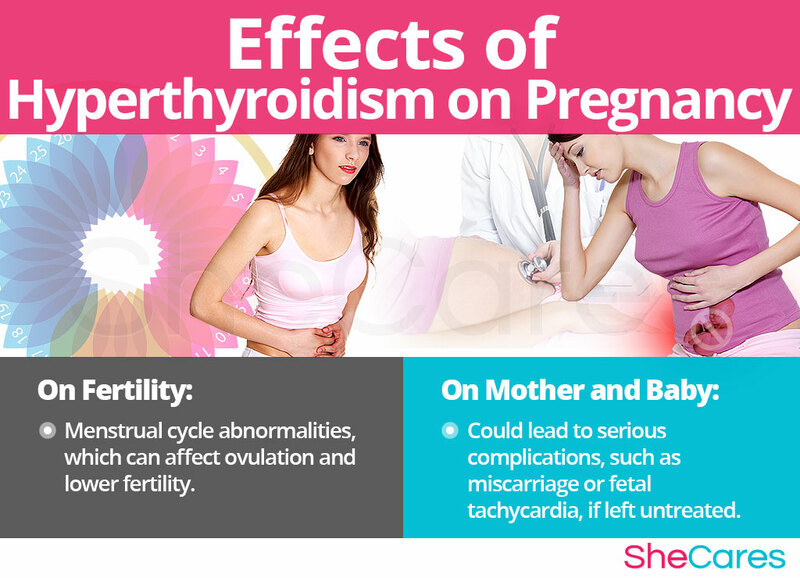 An overactive thyroid during pregnancy can increase the risk of a thyroid storm, an abrupt and potentially life-threatening worsening of the symptoms. Maternal hyperthyroidism that was treated with radioactive iodine or surgery can sometimes result in fetal hyperthyroidism because the antibodies might cross the placenta. High thyroid levels during pregnancy can also impair baby's growth, leading to low birth-weight, tachycardia, and thyroid dysfunction. Uncontrolled hyperthyroidism might lead to preeclampsia, maternal heart failure, preterm delivery, miscarriage, or stillbirth. 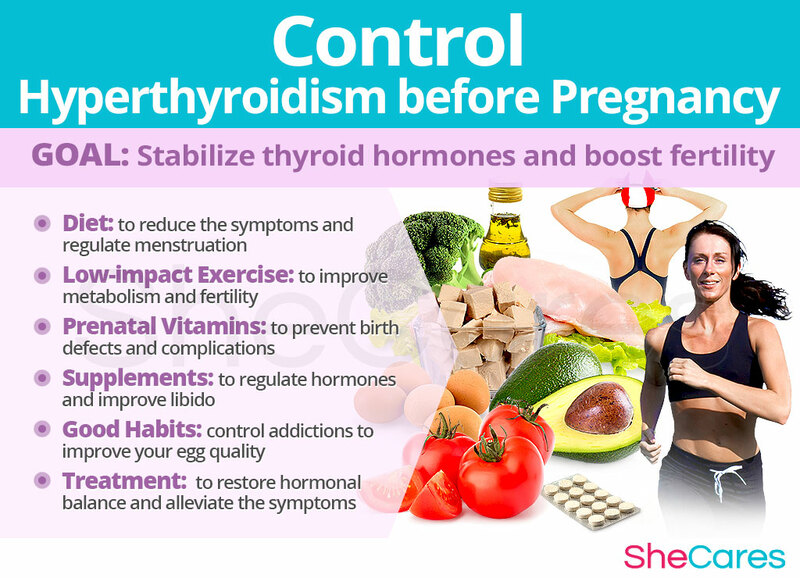 Your goal before getting pregnant is to stabilize your thyroid and reproductive hormones to regulate your menstruation and increase your chances of getting pregnant. Antithyroid medications can effectively balance thyroid hormones, but have to be carefully selected as some might be harmful during pregnancy. Radioactive iodine is used to destroy the thyroid gland so it does not overproduce hormones. After radioactive iodine treatment, pregnancy should be delayed for six to 12 months to prevent serious complications. Surgical removal of the thyroid gland or its parts leads to hypothyroidism, which is generally easier to manage with medications. Plenty of water will improve your cervical mucus and enhance conception. Avoid soy products, such as soy milk or tofu, as they have been shown to worsen the symptoms of hyperthyroidism and interfere with radioactive iodine treatment. Prenatal vitamins are full of essential nutrients, such as folic acid, needed to prepare your body for conception and support a healthy pregnancy. Learn more about prenatal vitamins. Hormone-regulating supplements, such as Macafem, can boost your libido, alleviate hormonal imbalance, and increase your odds of getting pregnant. CoQ10 has been found helpful in boosting fertility and nurturing the thyroid gland. B-complex, particularly vitamin B12, can alleviate the symptoms of an overactive thyroid. L-carnitine might be effective in reducing the symptoms of hyperthyroidism and improve fertility. Exercise is beneficial in managing hyperthyroidism and improving fertility as it increases blood flow to key reproductive organs. Keep your exercise regimen at a moderate level and avoid over-exercising to prevent palpitations and other unwanted symptoms. Opt for 30 minutes, at least 5 times a week of any type of physical activity, such as jogging, bike riding, or swimming. Quit alcohol and cigarettes to avoid pregnancy complications. Limit your intake of coffee and other caffeinated beverages to prevent a rapid heartbeat. Acupuncture has shown effective in treating imbalances of reproductive and thyroid hormones. Stress leads to elevated cortisol levels, which can inhibit your fertility. So, find your optimal way to reduce anxiety and stay calm through yoga, massage, or finding a hobby. Stay active, spend time outdoors, and surround yourself with friends and family for emotional support. Focus on foods that improve egg's health and ovulation, such as berries, pumpkin and sesame seeds, salmon, and dark leafy veggies. Thyroid hormones naturally increase during pregnancy. So, it is imperative to maintain regular doctor's check-ups, undergo a thyroid function test, and make medication adjustments, if necessary. Maintain your preconception action plan, get enough rest, and consider prenatal yoga to keep your stress levels in check. 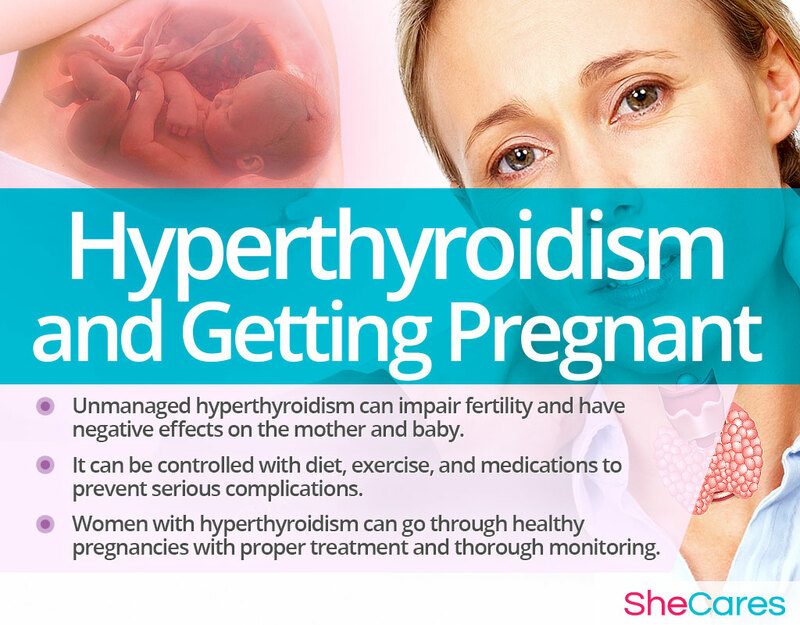 Undeniably, hyperthyroidism and getting pregnant are challenging topics for the mothers-to-be as well as their doctors. The risk of complications often forces women to delay their pregnancies and increases their anxiety, both of which negatively affect their chances of conception. 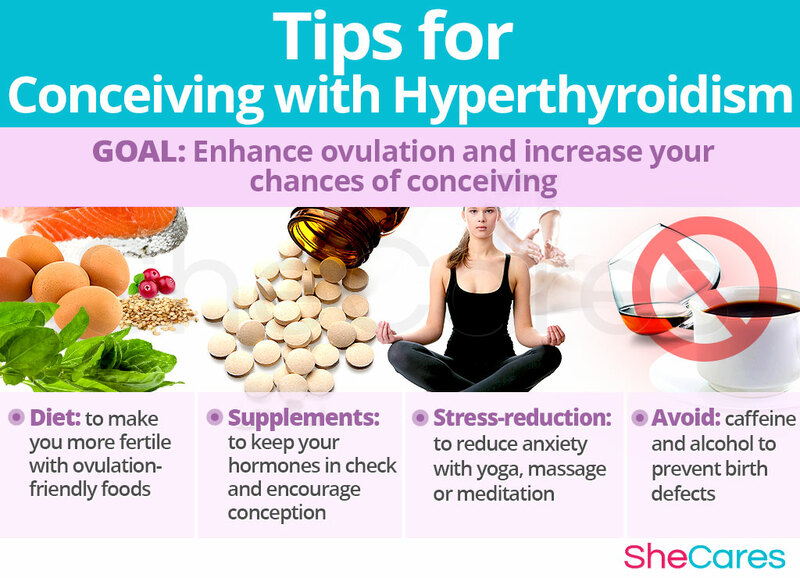 But current medicine offers numerous solutions for hyperthyroid females, which -when combined with a thyroid-supporting diet and supplements like Macafem - can prevent their disorder from restricting their chances for motherhood.